I love blue! It can be happy, tranquil, eloquent and everything in between. Here are a few blue rooms that I'm loving this week. Chinoiserie is defined as "the European interpretation and imitation of Chinese and East Asian artistic traditions, especially in the decorative arts, garden design, architecture, literature, theatre, and music" according to Wikipedia. Popularized in the 18th century, this pattern is timeless in my opinion. I love the lamps and stool in this office space! This space also features some Chinoiserie pottery used as flower vases again showing that old can be new again. 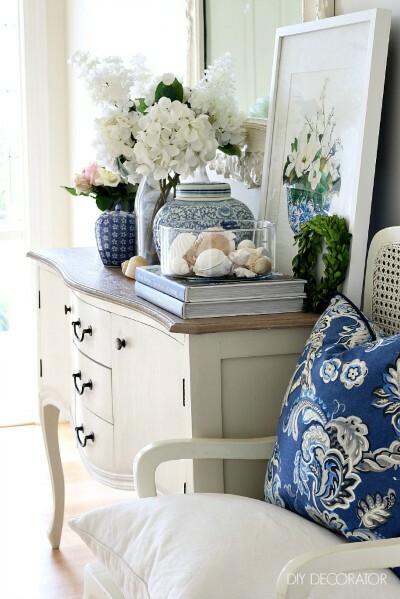 The blue pillow really helps to tie it all together and Iove the touch of the sea shells in a low vase- an easy idea to recreate at home! 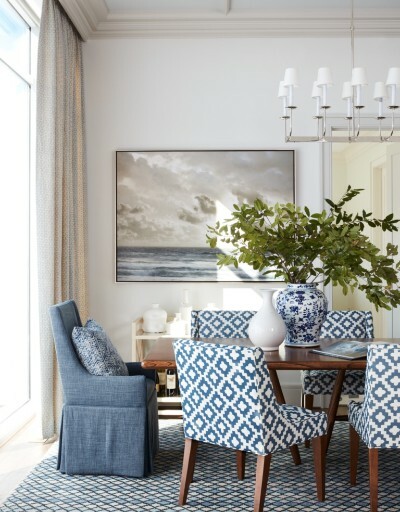 This beautiful dining room in an Atlanta condo has so many blues going on and it looks great! All of the blues are in the same color family and add so much texture to a room that can sometimes feel stuffy. Instead this dining room feels light and bright, especially considering it's a condo. 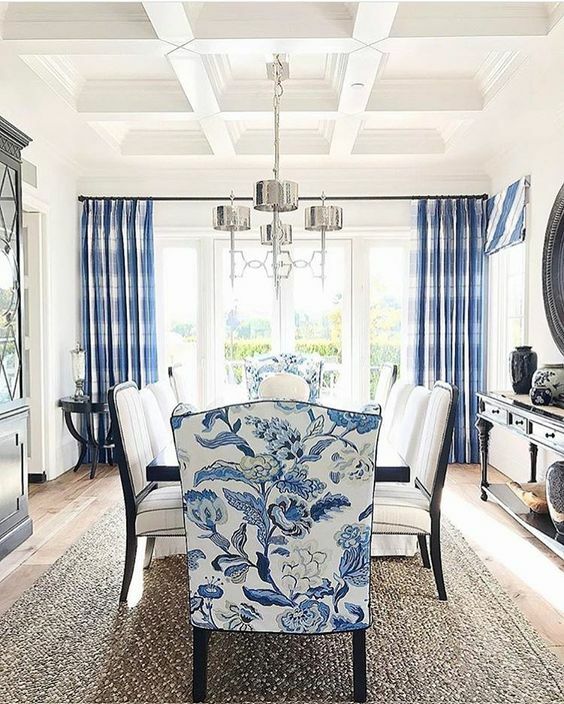 Here's another example of layering lots of blues but having some being a major focal point such as that great dining chair. Even though it's a bold floral pattern, it feels classic and timeless. 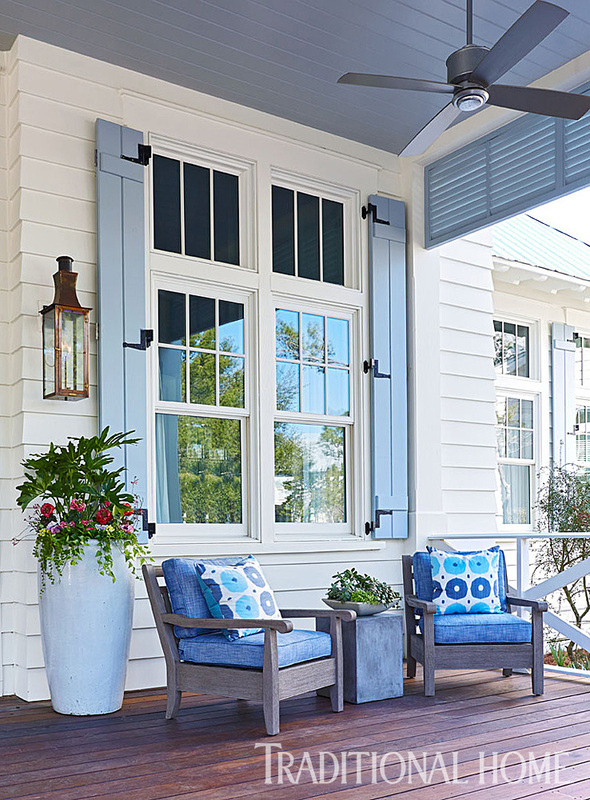 Who wouldn't want to relax on this front porch? Especially given our unpredictable Spring weather here in Indiana recently! The blue ceiling is a very Southern thing and the shutters just look happy!